How do Buyers Find Homes for Sale? At first you may think that this is just another how-to blog for buyers, but I promise that it’s not. Instead, this blog post is for current and potential SELLERS! The Peters Company wants to tell you how we help buyers find YOUR listing during their home search thanks to some tried and true marketing strategies. Internet– Over 90% of buyers used the internet in some way during their home search. That’s a huge number! Did you know that when we enter your property in the listing service that it’s then syndicated to over 500 consumer and third party websites providing the most exposure possible? It would be very hard for a potential buyer to miss your home when they start their search on the web! 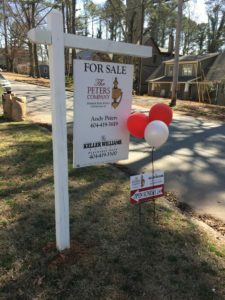 Yard Signs- A Yard Sign flags your house as “for sale” and provides a number for buyers to call to get more information. Many buyers further inquire on a property with a yard sign they pass by, especially if it’s in their desired neighborhood or area! We field these calls and emails, saving you time, and allowing us to market your home directly to the potential buyer. We can schedule a time to show them your property and share all the wonderful details that may make your home “the one.” Let us be your first line of defense for these types of inquiries! Real Estate Agents- We are well-connected! There are over 5,000 real estate agents in Atlanta alone. That’s a lot of industry professionals to share your listing with. 88% of buyers used a real estate agent in their home search. E-mail lists, social media, real estate agent search engines/websites, etc. are just some of the ways that we can get the word out about your listing! Sometimes we can even make a match prior to going on the market thanks to our well-established relationships with other agents. Wouldn’t you like the opportunity to potentially pre-sale your home?! Open Houses- Many buyers visit an open house at some point during their home search. We always try to host an open house the first or second weekend after one of our listings goes on the market. We advertise them all over the internet the week prior to the open house, place small directional signs throughout the neighborhood a few days ahead of time, and even go door-knocking the day of to invite neighbors and friends. We try really hard to get as many people as possible through your home during an open house- you never know when your buyer could come through that door! These are just a few of the ways that The Peters Company works hard to get your home sold. We have a very detailed marketing plan for your home. We are able to get top dollar in the least amount of time possible. If you’ve been thinking about selling, please give us a call today. We’d love to help you!